One of the key ingredients in Greenies is chlorophyll. Chlorophyll is a plant extract that provides the breath freshening effect of Greenies. 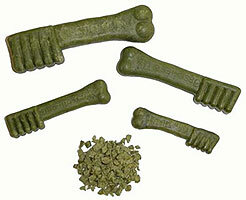 Other pet chews such as Dentabones do not contain chlorophyll, and as such do not provide the same effects as Greenies. An Australian firm who was receiving samples of Greenies from the US tell an amazing story about being hauled into the Customs office when the samples arrived. A dog sniffing the package went ‘wild’ when sniffing the Greenies and customs were certain they had intercepted illegal drugs. But the sniffer dog was just excited about the aroma of Greenies. Independent tests conducted by a highly respected research kennel showed that dogs that were fed just one Greenies a day experienced an eight-fold decrease in dental plaque accumulation. Greenies also help freshen a dog's breath, clean and whiten teeth and improve the digestibility of a dog's regular diet. Seventy per cent of the dogs in the test chose Greenies when given the choice of Greenies and a leading commercial chew treat. Lil'Bits for toy breed dogs, dogs less than 6 months old or dogs who "gulp". These are sprinkled over food and are small,finely chopped Greenies, rather like coffee sugar granules.